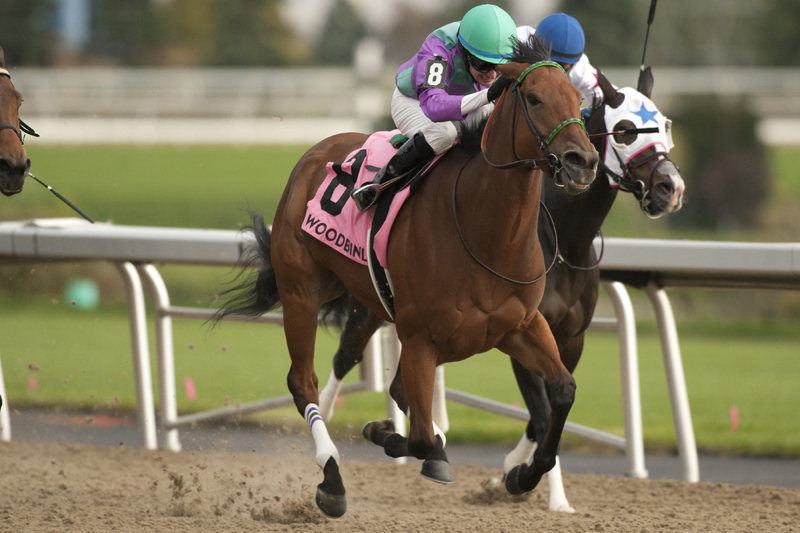 Owner/breeder Ivan Dalos’s 2017 Breeder’s Cup runner-up Ami’s Mesa was the 5-2 favourite competing back at Woodbine for the first time this year in Sunday’s $125,000 Ontario Fashion Stakes (Grade 3), but it was his longshot that stole the show. With jockey David Moran aboard, Dalos’ other homebred filly Silent Sonet pulled off a 56-1 upset in the six-furlong sprint after pressing the pace throughout. Silent Sonet took over command at the five-eighths pole and prevailed in 1:08.77 ahead of Jessica Krupnick and defending Ontario Fashion champion Moonlit Promise, who both rallied outside to hit the board after stalking along the rail. Multiple graded stakes winner Code Warrior, who had led the field of a dozen distaffers through fractions of :22.83 and :45.15 in rein to Jesse Campbell, settled for fourth-place while Marquee Miss rounded out the top five finish order after racing three-wide most of the way. The Sovereign Award-winning mare Ami’s Mesa, trained by Josie Carroll, raced mid-pack and finished seventh. Silent Sonet, who had previously won a pair of stakes on the turf, earned her first graded win and returned a whopping $114.80 for a $2 win ticket. Silent Sonet gave owner Dalos his meet-leading seventh stakes victory. The four-year-old Silent Name-Dynasonet filly is now five-for-12 in her career with more than $300,000 banked in purse earnings. She combined with Jessica Krupnick for a $2 exacta payout of $1,220.60 and led a trifecta that returned $3,244.50 and superfecta worth $9,215.85 for $1 tickets.